Thanks for a great challenge last week, your Masculine cards were great! This week we challenge you to make Thank You cards for our heroes to send home to their family and friends! Our sample card maker this week is Kathy! To see more of her wonderful art work please visit her blog My Creative Impulse. Thank you Kathy for sharing your awesome creativity with us! Great job Kathy – I enjoyed looking through your blog – and the colors you use are awesome. Keep up the great OWH work. Your cards are so cute! I especially love the little flowers on the 2nd card. They're so bright and cheery! You make beautiful cards, Kathy! Thanks for being the sample cardmaker! I love all the cards and I am always impressed with how fast you all create them and how different each card is! These are both beautiful card samples Kathy and many more to inspire on your blog too! Beautiful cards Kathy! 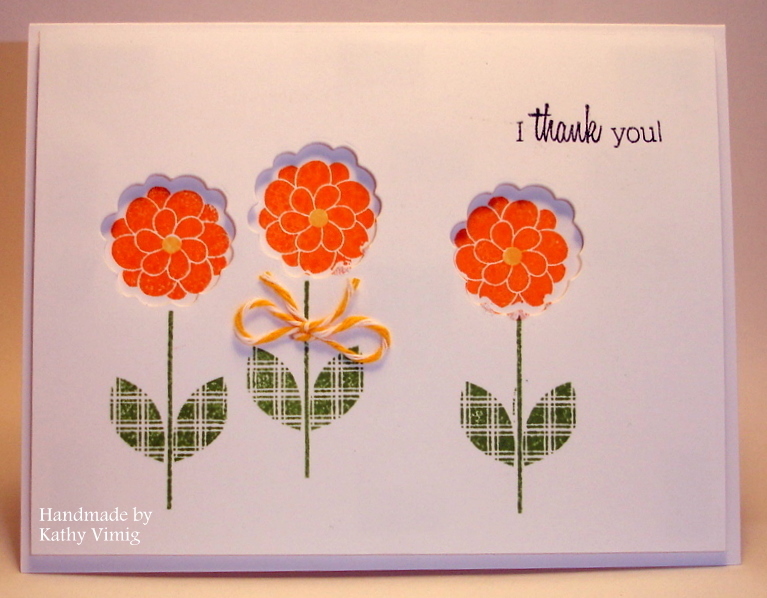 Thanks for being our sample card maker for this challenge! Love the first one especially, but love the second one, too! All of these cards are so pretty. Thank you for sharing.